With several local celebrities on hand as well as, due to remarkably good timing, the brilliant American writer and actor Anna Deveare Smith, trophies were handed out yesterday to student filmmakers from Lebanon, Jordan, and Qatar, in the closing ceremony marking the end of the first annual Zayed University Film Festival. Twelve films from the 70 films the festival received from universities across the Middle East were selected as finalists and played during screenings attended by over 500 people over the course of three days, along with a selection of semi-finalist films. Grand prize went to Lebanon’s Naji Bechara for “Talk to the Brain,” a satire on the repressiveness of secondary school education, Best Narrative Short went to Amjad Al Rashid “Bitter Days,” a heartbreaking story of a little girl’s life on the street as a shoe shiner, and Best Documentary went to Qatar’s Sharoukh Al Shaheen for “Lady of the Rosary,” a multifaceted look at the building of Qatar’s first church. Abdul Salam Al Haj received an Audience Favorite award for “Yousef,” the bittersweet tale of a young man whose only connection to his late mother is her radio. There were also amongst the finalists films about marriage, Dubai-style; mistaken identities; complications of father and son relationships, the complications war –just to name a few of the topics. An audience member asked after watching several of the films, “Why is everything except the marriage stories so intense and dark?” I wondered if she was actually living in the Middle East. That these filmmakers were able to find the humor, sarcasm, and irony within telling stories of their realities is an attribute to their grace and creativity. But the other real winners of this festival are my two students, Reema Majed and Al Yazyah Al Falasi, the two girls who came up with the idea as their senior project, and against formidable odds, several nay sayers and a ridiculously short window, pulled off a festival that offered a compelling series of films, a creative and engaging advertising campaign, and a well-produced show that ran flawlessly for three days. In country where everyone is always claiming to be planning the “the first” or “the newest” something, they really did. And if that isn’t achievement enough, there is also “Let the Show Begin,” a student film that screened from Baghdad about keeping the Iraqi Film Festival alive amidst destitution, daily tragedy and occupation. I hope that all these students will be able to let the shows continues. Much as I love film and much as it has been such a big part of my life, I don’t often watch the Academy Awards, even when I’m invited to Oscar parties at friends’ houses. Aside from crying along with the winners on the Miss USA pageant as a kid, I’m just not that interested in award shows—I’d rather see the movies. And when I lived in LA, the Oscars were just such a great time to go out and run errands, as the streets were as empty as Christmas. However, this year I watched them because of another film award show. 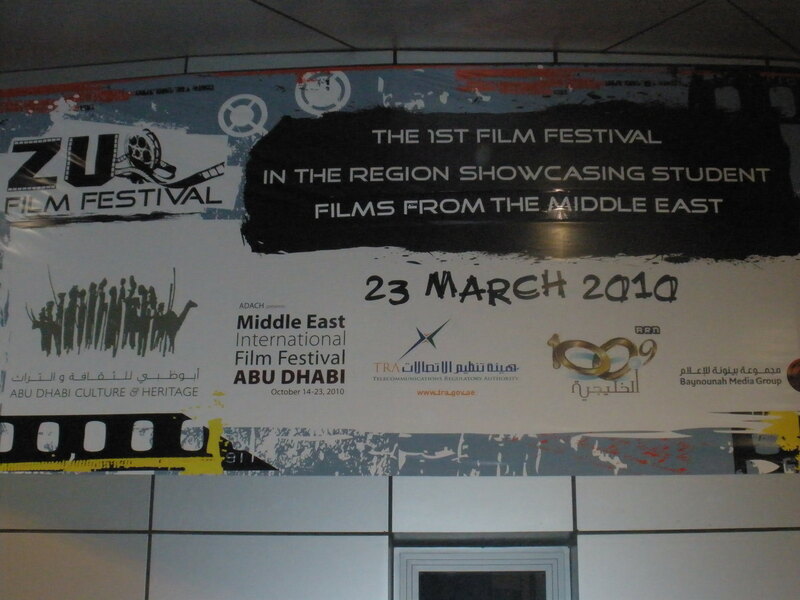 Two of my students, Reema Majed and Al Yazyah Al Falasi decided in March that their senior project would be create the first annual student film festival in the Middle East, with three awards to be given out for top documentary and narrative shorts. Monumental as a task as this is, they were determined, and the result as been several nights of insomnia for me, as I’m sure it has for them. One of those insomniac nights, I turned on the TV, a rather unprecedented event in of itself, and there were the Oscars just beginning. What the heck, I thought, I’ll keep them on and mark papers. The papers I had to read were for a class assignment in which I’d asked students to compare The Hurt Locker to Casablanca, as two movies set against war and the Arab world. In a class of 30, I’m the only one who preferred Casablanca, although most of the papers seemed to reflect an uncomfortable feeling about how the Iraqis were portrayed as unsavory or stupid and the US soldiers as the saviors of the Iraqis, if not the saviors of themselves. But in the midst of reading the papers, I considered it kismet (title of another movie with a Middle Eastern setting, albeit far more fantastical) when Steve Martin or someone mentioned that this was the first time 10 films had been nominated for the Oscars since Casablanca won in 1943. Yes, perhaps if Jordan could manage to be the set for such a complicated shoot as The Hurt Locker, then perhaps it is the right time indeed for their to be a student film festival in the Middle East. I’m so excited for what our students have accomplished—the Zayed University Film Festival, which received nearly 70 films from eight countries from Egypt to Lebanon and Palestine to Qatar, including Iraq and Jordan, rolls out the red carpet next week, literally, for a festival that will showcase more than 30 films, including the 12 finalists. Many of the films seem to deal with the issue of identity amidst the turmoil of the filmmakers’ personal lives and the tumultuous and rapidly changing world they live in. Making a film as a student, particularly with limited means, is not an easy thing, nor is setting up a film festival to give them a chance to be viewed, so if you’re in town please come and enjoy the show. It’s an armchair seat into the minds of today’s Middle Eastern youth.